If you’ve ever spent more than you should have, gone over your budget, or regretted a purchase, this one’s for you! 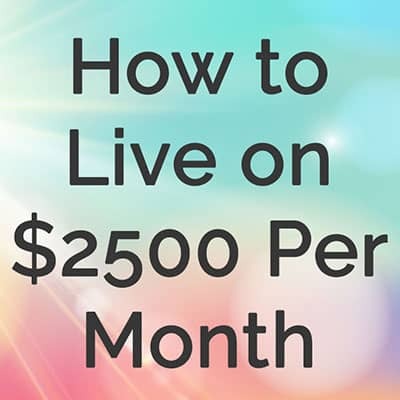 Since for years our monthly budget was less than $1500 (and is now close to $2500 per month), you can imagine that I’m pretty amazing at NOT spending money 🙂 . Even when we had very little, I rarely felt deprived. We’ve always had what we needed and by living simply, we didn’t need much. Over the years, I’ve changed some of my habits so that I don’t miss shopping and I don’t feel the urge to buy stuff unless we really need it. It’s obvious, but it’s the most important place to start. Has anyone ever gone to the mall and not spent any money? At the very least, you buy a smoothie or a cinnamon sugar pretzel, right? Man, those pretzels are good! You don’t take someone who is trying to drink less alcohol to a bar and you don’t go to the store if you don’t want to spend money. Simple. Repeat after me: Shopping is not a hobby. If you don’t have money to spend, don’t go to the store. 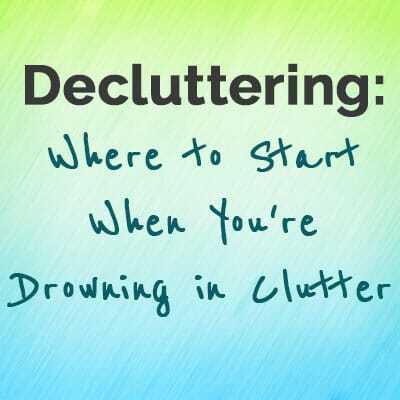 And if you need to go to Walmart to buy groceries, don’t wander through the craft supplies or home decor section. It’s just too tempting. A lot of the things in our house only get used a few times a year. I’m sure that I could find a family member or friend to borrow from instead of purchasing something that’s just going to sit around most of the time. We’ve borrowed tools, suitcases, and extra bedding for guests instead of buying something we might only need once. Tip: Before you go buy something new, think about how often you will really use it. Then check and see if you could borrow it from someone instead. Before we started drinking coffee regularly, we didn’t own a coffee maker at all. We had instant coffee for when it sounded good. Until I inherited my grandma’s china, we didn’t have wine glasses. We drank wine out of normal cups. We don’t own many serving dishes. We use glass bakeware as serving dishes if we have guests over for dinner. We’ve gone without a lot of things because we found that we could easily use something else. Why spend money and take up space storing extra stuff when you don’t have to, right? Tip: Before you rush out to buy something, think about if there is something you already own that could be used instead. This is tough for me! I don’t love going shopping, so I’m not tempted by the mall. However, online shopping is a whole different story. Tip: To avoid online stores, don’t save them to your favorites in your web browser. Also, unsubscribe from all of those tempting emails telling you about sales. Seriously, there isn’t a day of the year that there isn’t a sale happening (I’m looking at you, Pre-President’s Day Sale). You can always sign up to receive emails again when you need to make a purchase from that online shop if you’re worried about missing out on deals when you need them. Most websites want to save your billing, shipping, and credit card information. It’s way faster to make a purchase next time because they already have all of your information. However, it makes it much easier for you to click the “Submit Order” button. Tip: When you make a purchase at an online store, make sure to not let them save your info. Next time you want to purchase something, it will take you some extra effort because you will have to enter your billing, shipping, and credit card info. It’s silly, but that little bit of extra effort just might make you re-think your purchase and if you really need it. Ok, so keeping a list of things you need might seem weird if you’re trying not to spend money, but go with me on this one. If you keep a list of things you need, you will have time to think through those items and make sure they really are “needs”. Also, it will remind you of what to look for when you do go shopping. You are less likely to spend on impulse purchases when you know you should be looking for a few specific items that you know you need to spend some cash on. This is some classic advice. If you see a cute top you want, tell yourself that if you still want it in 24 hours, you can go back and get it. Once you get home you might realize that you have 27 black tops already and you probably don’t need another. Stores thrive off of getting customers to buy on impulse. Speaking of impulse purchases, I’ve got whole posts about ways to avoid impulse purchases and how to know when you should make an impulse purchase. Sometimes, an item seems less appealing when you think about how much you had to work for it. Example: Let’s say you make $10/hour. If you find a super cute comforter for your bed marked way down to $90, you had to work 9 hours to afford that comforter. More, if you think about taxes being taken out of your paycheck. You might end up thinking that that’s a lot of hours to work for something you don’t really need. I just did this the other day. There was this cute dress and Sam’s Club that I really wanted. I was good and didn’t buy it. Well, when we went back to Sam’s Club two months later, they still had it! I had been thinking about this dress the whole time, so I decided that it was fate and I bought the dress. It turned out that it didn’t quite fit right (there’s no place to try things on there), so I returned it, haha! The point though, is it wait and see if what you want is still available next time. If you have a hard time sticking to your budget, don’t bring more cash than you are supposed to spend. If you only have $50 to spend on groceries, bring $50 of cash into the store. You’re not allowed to cheat and use a credit card if you go over budget. Use a tally counter to add up your purchases as you go. I can’t remember where I heard this advice, but I like it. If you are overspending, wrap a special note around your credit card telling yourself why you shouldn’t spend money. The note could say something like “saving for vacation” or “house downpayment” or “we’re almost out of debt”. The note should remind you of your goals and why you don’t want to spend money. Then when you go to buy something unnecessary, you’ll think twice as you unwrap your card to pay. Grocery shopping 101: Never shop without a list. Know what you need. Buy what you need, nothing else. If you’re tempted to spend money on entertainment like going out to eat, to the movies, or for drinks with friends, keep a running list of free entertainment ideas. Most cities have tons of free events happening if you want to get out of the house. Do a Google search of “[Your City] Free Activities” to see what’s happening in your area. You do not need to spend money to have fun. If you keep a list of fun, free ideas, you’ll be less likely to spend money on entertainment when you’re bored. 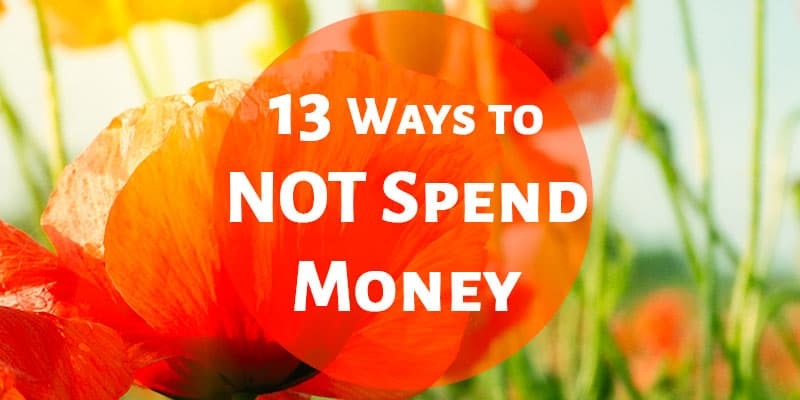 It might seem silly to talk about how to not spend money, but it’s an important topic! If you can’t get a handle on your spending, you’ll struggle with budgeting and reaching financial goals. 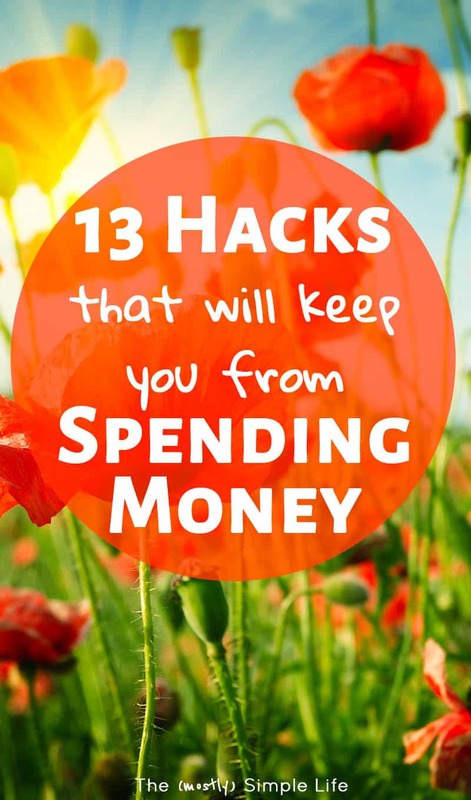 Having these strategies in mind will keep you from spending money unnecessarily. ⇒ What are your strategies for not spending money? Before I actively started saving money, I enjoyed shopping. Now I loathe it. I hate stepping foot into stores (Target is the exception). I also really love your advice about borrowing. We’ve found that to be extremely helpful. Why should I buy power tools when my brother in law has them? No point! Plus you save storage room! Thanks Hannah! I don’t like shopping now either. If I go, I have a list and want to get what I need and leave. Tools are definitely a good thing to borrow since you don’t need them that often usually! These are perfect! It’s crazy to me how many people view shopping as a hobby! I definitely don’t have that mentality! That’s good Susannah! You’ll save tons of money by not shopping for fun. Borrow! Yes! I had a surprise 3rd kid, after I had already given away all my baby stuff. This time I just borrowed everything! Such great tips! I really like the idea of asking to borrow something instead of purchasing it. I’ve found that would have been a lot more economical for large tools and things of that nature. Great post! These are really great tips. I am an impulse shopper, but keeping myself from that temptation will definitely help a lot! These are great strategies! I went to the dollar store to grab some pet food the other day and realized that I’ve not been in there very much at all this year. No coincidence that it’s the #yearofno in our house. It certainly has saved us a ton of cash. All those dollars sure add up Jamie! I know you guys have made a lot of changes. And I love your motto for the year! Great tips. I am a numbers person myself, so I like to think about how many hours I have to work — after taxes — to buy things. When you account for all the taxes, most of us only have about 65% left over. That means $10 per hour is only $6.50 in cash after taxes! That’s a lot of hours just to pay car insurance each month! I totally agree Bill! It really puts things into perspective. I think remembering shopping is not a hobby is a really important view and I think for many it is a hobby. Personally I love window shopping and can spend hours looking at homewares without leaving with a thing as for me I like to dream and get inspiration of what I would have in my ‘dream home’. I think it helps living a small apartment because I know even if I wanted to buy more I don’t actually have the space (we definitely have a lot of multi-purpose items rather than buying lots of things). 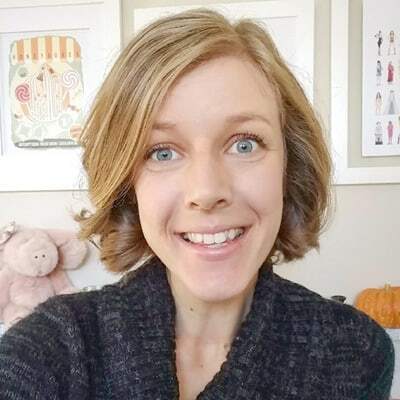 Thank you for sharing some great strategies. Staying out of the store is key for me! If I’m walking down an aisle, it’s like giving myself permission to walk out of the store with a bag. I’d rather just stay at home than end up being broke. Well said, dear! Thanks Latoya! It’s good you know your weakness! The 24 hr rule always applies in this home. Sometimes we extend it to a week. I definitely agree with you on the online shopping and think that it is so easy to click buy!!!! For sure! Amazon even has one-click buys for some items so you don’t even go through the shopping cart. “Don’t go shopping” is the kicker for me on this list. Shopping is too easily used as a form of entertainment, rather than necessity! I’ve recently fallen in love with Goodwill, however, which definitely helps my shopping urge and and keeps us within our budget. This is really good advice! Cutting the gym is even easier if you have a buddy to do it with you, for me it’s hubby and we motivate each other to stay in shape. Thanks for your comment Kathy! I’m not sure we have metro in our area. We live in a really rural area so it’s hard to find phones that give good service. Fantastic advice. Definitely agree with not going shopping. When I grocery shop I make sure I’ve eaten first, you’re more likely to buy food if you are hungry, then shop to the recipe and try to go on my own. I really loved reading these, I am going to have to try wrapping up my card with a note, that is great! I always see if a family member is getting rid of something before I buy it. I needed a clothesline for my yard and was talking with my nephew about building me one, when my parents said that someone had just given them two clothesline posts for free. I always try to find a family member to trade with or build something for me for cheap before going to the store, I even learned how to sew my own clothes since I am such a cheapskate (except now when people ask me where I bought something I have to say “the fabric store”). That’s awesome Cara! I would like to try sewing my own clothes, but I haven’t really gotten into it yet.